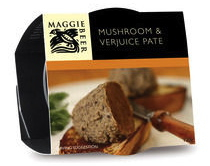 A full flavoured vegetable pate based on seasonal ingredients. Perfect to serve as an appetiser, spooned straight from the tub onto freshly toasted bread. Enjoy with crudite of raw vegetables, biscuits or melba. Perfect for a shared starter, warmed and spread thickly on a bruschetta with a glass of Pinot. MUSHROOM (47%), THICKENED CREAM (CREAM, MINERAL SALT (450,500), VEGETABLE GUM (400)), EGG, RED WINE (PRESERVATIVE (220)), ONION, BUTTER, VERJUICE (PRESERVATIVE (220)) (2.6%), SALT, PORCINI MUSHROOM (0.3%), GARLIC, HERBS, PEPPER, VEGETABLE GUM (406). CONTAINS EGG, MILK & SULPHITES.